Classes — Woodinville Toddler Group | Play. Learn. Explore. Find support for your growth and journey as a parent. Developmental curriculum provided for your toddler. Feature sensory activities and open-ended art. Enjoy our outdoor play area. An inclusive community that promotes class chemistry and unity. Evening parenting education and family events in addition to our weekly classes. Enjoy a first group experience with your “wobbler”! Focus on large motor and sensory play. Early art experiences introduced mid-year. Parents discuss a variety of topics, while meeting on our carpet area in the classroom. Share lap and circle songs together, provide own snack. A support network for parents, and a group setting for your one year old. Children explore in a multi-sensory environment, and are introduced to creative art experiences. Lots of movement provided during our circle time, with instruments, puppets, felt stories, and songs. Parenting education features topics tailored to your growing toddler, routines, and relationships. A fusion of our 12-24 month, and 24-36 month classes, parenting education and curriculum. Discussion topics and activities dependent on the make-up of the families enrolled. Additional art experiences and science exploration added to the curriculum. More focus on dramatic play and dress-up. Games and turn-taking activities introduced during circle, in addition to the activities of the younger classes. More attention given to our parenting styles, and way of interacting with our toddler/preschooler during in-class parenting education. A twist on our 24-36 months class for those toddlers who just miss the age cut-off for preschool. 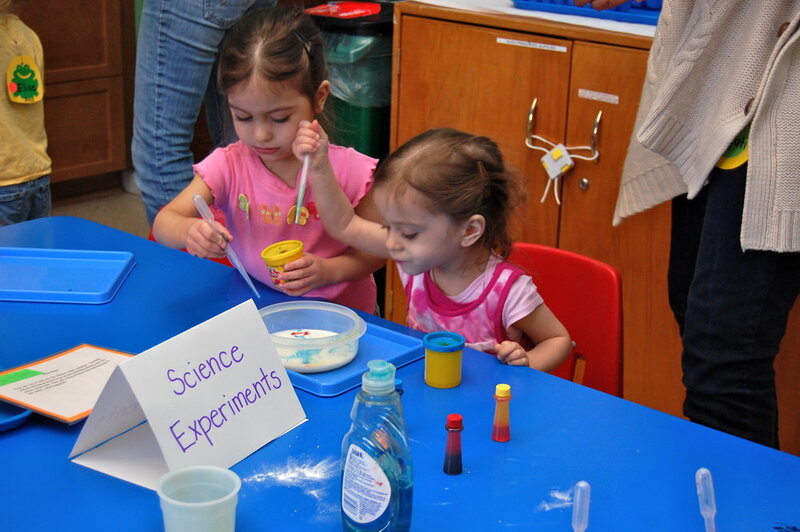 In addition to the experiences offered in our “2’s classes,” we will practice skills necessary for preschool success. Parenting education topics will include ways to support your toddler’s growing independence! Attend three parent education events per quarter. Events may include speakers on topics such as nutrition, sleep, relationships, emotion coaching, etc. Family events may include hikes, visits to a park or farm, and dinner parties out. Our All-School Calendar has all the details! WTG sponsors enough events for you to meet your requirements, but activities you do on your own or with your family may satisfy these requirements as well. As a cooperative program, parents are asked to share in a rotation of class support tasks such as providing snack for their class once or twice per quarter, cleaning up the classroom and setting it up for the next class. We also ask that each class participate in one set-up or tear-down activity to support our great program. Participation in fund-raising activities and events is encouraged and appreciated, but not required. WTG’s school year is from September to May. While our school year is divided into quarters due to our affiliation with LWTech, WTG is a yearlong program. We welcome new families throughout the school year until the middle of March.